An MP who claims to have been cured of epilepsy by a medication which causes birth defects in children has joined calls for an inquiry into the drug. About 20,000 children in the UK have been left with disabilities caused by sodium valproate since the 1970s. 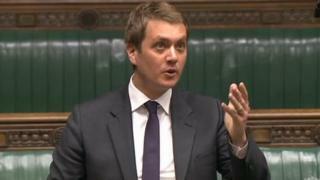 James Frith, MP for Bury North, said he took the drug for many years but was "stunned" to learn that health warnings to pregnant women had been withheld. The medicines regulator said warnings of any health risks had been updated. Babies exposed to the drug in the womb also have a 40% risk of developing autism, low IQ and learning disabilities. The drug has been prescribed since the 1970s but it was only in 2016 that warnings were put on packets. Mr Frith told a parliamentary debate on Thursday he developed epilepsy as a side effect of meningitis at the age of seven, when he was in a coma for two days. The Labour MP said he wanted to "give a voice to" epilepsy sufferers after having taken sodium valproate for several years, which was "widely thought to have been the greatest contributing factor in curing me". "I stand here as record of its effectiveness, but I do not stand up without remembering the unborn children, the women and the expectant parents for whom the risks are not widely enough known." Liberal Democrat MP Norman Lamb, who was a health minister between 2012 and 2015, told the Commons that information had been withheld in the 1970s about the drug's impact despite knowledge of the risks. Nearly 400 babies affected by valproate had been born since an awareness campaign was launched in February 2016, MPs heard. Mr Frith called on the government to "make amends for this national scandal" and consider compensation for victims. He also said it should "apologise to the women and children who are now men and women themselves" and ensure that no information concerning health and medical prescriptions are withheld again. A government spokesman said: "As with all medicines the safety of valproate in pregnancy has been kept under constant review and as new data has become available, the warnings have been updated. "We continue to work closely and collaboratively with professional bodies to raise awareness of the risks associated with taking valproate medicines during pregnancy." The European Medicines Agency is considering whether to take further regulatory action.